The application represents the staging of the written proposal for my next work shichimi togarashi. The application is a piece, a result, and will be valuable in its own right and presented as such. At the same time, it is an attempt to find a way of producing my next project without the conventional intermediate step of applying to public or private institutions for funding. Thus, the application is “the application” for shichimi togarashi. In the application, the score is “translated” into actions, which are not necessarily the actions that will be developed in the future piece. This creates a complex relationship between the application and shichimi togarashi and raises the question: Where is the boundary between them? 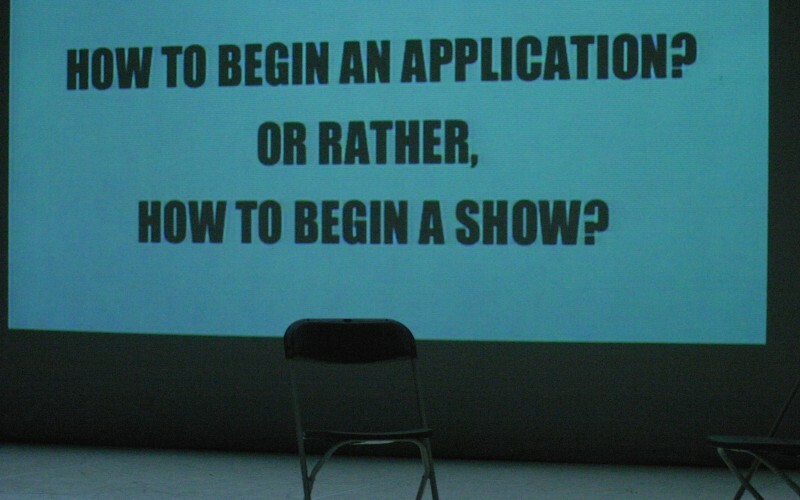 It also illustrates the main point of the piece, namely how to go from writing to choreography. In other words, shichimi togarashi would not be the same if I had never done the application – almost to the point that shichimi togarashi is no longer real, or…is it? Performers: Eva Meyer-Keller, Amaia Urra, Catherine Mullins, María Jerez, Rico Repotente, Oliver Benn and Juan Domínguez. Music: Randy Newman, Tchaikovsky, Maria Mckee. Co-produced by: Tanz im August InternationalesTanzfest, Berlín.